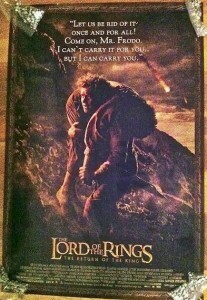 In July 2001, the American Library Association (ALA), in association with New Line Cinema, offered three different Lord of the Rings Bookmarks and identical full-size posters in honour of J.R.R.Tolkien’s works and Peter Jackson’s films. This sale is for just the hard-to-find Bookmarks. 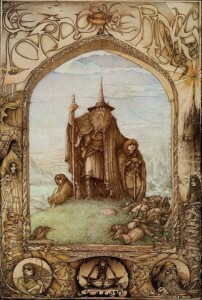 They include Frodo Baggins (Elijah Wood) “Make It AHobbit”; Arwen Evenstar (Liv Tyler) “Fantasize New Worlds”; and Gandalf (Ian McKellen) “Discover Magic”. Also included in this Auction is the newest ALA tribute to Tolkien’s works and Jackson’s films The Hobbit, Bilbo Baggins (Martin Freeman) “Take An Unexpected Journey” released in November 2012. 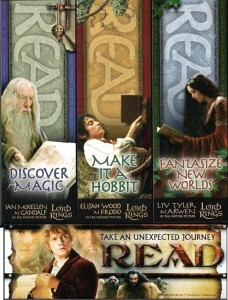 The 3 Lord of the Rings Bookmarks are out of print and will not be re-issued per a 10-year copyright agreement; although Bilbo is still around 🙂 Each Bookmark measures at 2″ x 6″ and is made of light card stock. One side has the picture as seen in this listing, and the other side is blank white.